Russian rabbi; born in 1826; died at Kherson Dec. 4, 1896. He graduated from the rabbinical college at Jitomir, and for about forty years officiated as rabbi in Kherson and in the Jewish agricultural colonies of Kherson and Bessarabia, in whose development he always took an active part. He introduced many useful reforms in the Jewish community of Kherson, and, being familiar with the Jewish question in Russia, was repeatedly summoned by the government to the conferences of Jewish rabbis at St. Petersburg. 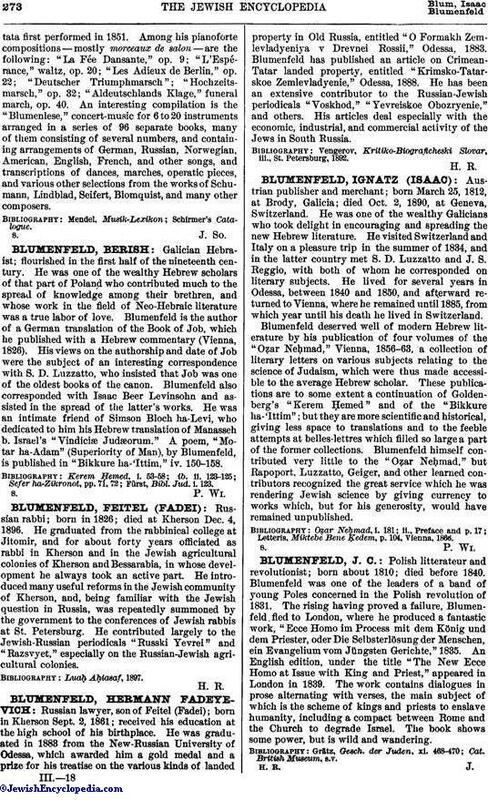 He contributed largely to the Jewish-Russian periodicals "Russki Yevrei" and "Razsvyet," especially on the Russian-Jewish agricultural colonies.